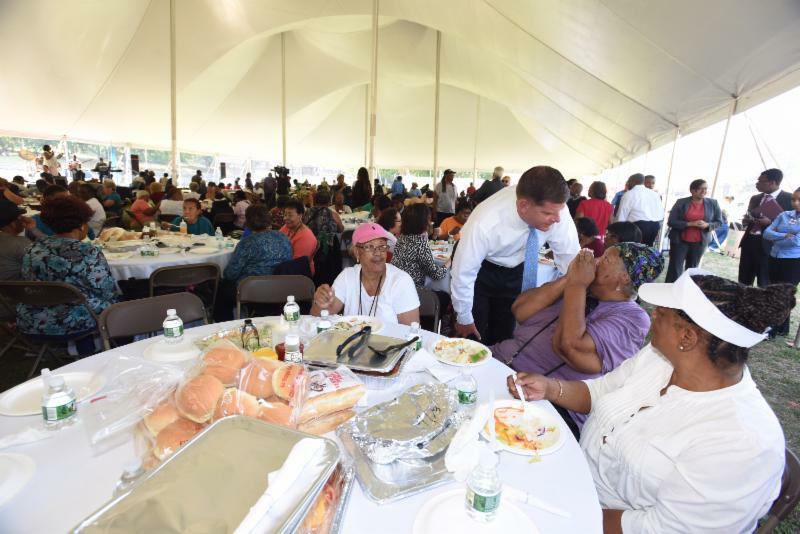 BOSTON - Wednesday, September 13, 2017- Mayor Martin J. Walsh, the Commission on Affairs of the Elderly and City Fresh Foods today hosted the 13th annual Senior Party in the Park in the Park at Malcolm X Park in Roxbury. "Party in the Park is an annual celebration that brings together hundreds of Boston's older residents for a day of fun," said Mayor Walsh. "This event showcases the value and vibrancy of Boston's diverse communities, and is a great way to close out the summer together." For the past 13 years, the City of Boston's Elderly Commission and City Fresh Foods have partnered together provide an end-of-summer party to 800 older adults in Boston. Sheldon Lloyd, CEO City Fresh Foods, said, "We are honored to partner with the City of Boston to provide the senior community with an eventful day of dance, music and great food." Initially started as a small picnic, the event has gained popularity and is now the City's second largest annual event for seniors. "I've been coming to these events for 18 years," said Julia Martin, 88, of Jamaica Plain. "My group and I benefit a lot from them. It gets us out of our buildings." For others in the crowd, this was the first time attending. "My friends come every year," said Charles Britt of Mattapan. "Curiosity brought me here today." The event event featured a brief speaking program, lunch provided by City Fresh Foods, and entertainment by Athene Wilson and Band. "I've been coming to this event for at least 10 years," said Aliki Edwards, Director of Admissions and Marketing of the Sheehan Health Group. "Events like this let people know about services and quality of care right here in the community."